Note: Not for use with Mallory HYFIRE Electronic Ignition Controls, or any other high energy, inductive storage ignition system. Mallory's Universal Canister Coils are designed for UNILITE, Magnetic Breakerless (MBI) Distributors and Conversion Kits. These 12-volt coils feature an oil-filled design and arc resistant alkyd top for superior performance, insulation and cooling. They offer a bolt-on, nostalgic Mallory apperance. Does Mallory 29219 fit your vehicle? 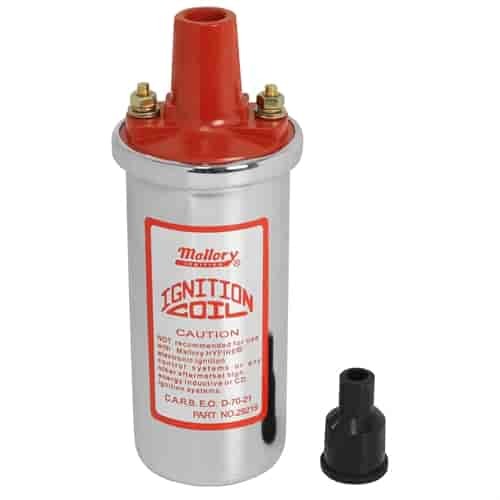 29219 - Mallory Universal Canister Coils is rated 5.0 out of 5 by 1. Rated 5 out of 5 by Weld 63 from Quality item I got this for Christmas and won’t be installing it until the spring. So I really won’t know anything until then but it was priced right and had good reviews. Packaged very well too.